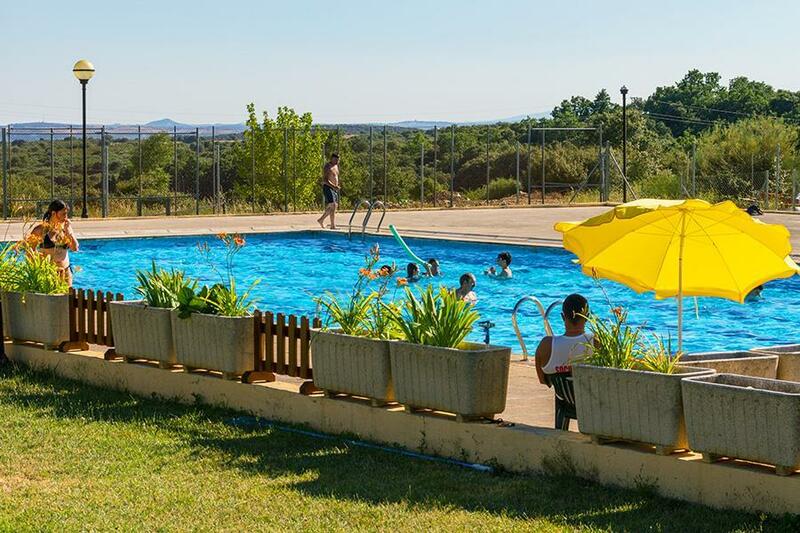 At Campsite Sierra de la Culebra in Figueruela de Arriba (Zamora) camping costs as little as €20,- per night during low season with CampingCard ACSI. At one of the 64 touring pitches you will get a discounted rate during the period 09-03-2019 - 10-07-2019 and 27-08-2019 - 02-11-2019. At this campsite you can not only use your CampingCard ACSI for inexpensive camping, you can also use your ACSI Club ID (as an alternative ID). You will receive a warm welcome on this site surrounded by nature. Abundance of wild flowers, especially in springtime. Peace and quiet. Spacious pitches. The Iberian wolf lives here and may be observed. Restaurant with home-made traditional specialities. Pool open 29/6 - 8/9. Large entrance for 14 metre outfit but corners a bit tight inside. Had to unhitch and motormove the 8.2 metre caravan round them. The 5 inch kerb around every pitch were a challenge but fortunately we had some small ramps. There are timber bits about to be used for that purpose. We were the only people staying there. Extremely quiet. Good clean facilities. Did not use the restaurant but menu del dia was listed at €10. Lovely site. Good value food in restaurant prepared by owners. Peaceful beautiful surroundings. A great site for a few nights. Stoops over for 4 nights on way from Santander to Douro valley. We stayed for two nights 23rd and 24th April ‘18 in our VW camper. This is a peaceful, rural campsite in the sort of oak parkland that is seen a lot in this part of Spain. It’s a great choice if you want a peaceful retreat. The washing and showing facilities were spotless and in good order. It was out of season so we didn’t experience the pool and tennis courts etc. We had a nice meal at the site restaurant for around €10 each including wine. The staff were very helpful and you can get bread and some basic provisions on site out of season. Beautiful situation with good-sized pitches, some shaded by trees. Well laid out with concrete roads but access to pitches made difficult by kerbs so only 4*. When leaving we used our yellow levelling wedges to ease the van's descent from grass to road. Showers have good hot water, but changing areas of cubicles open to communal space with long bench. Modesty is preserved by shower curtains. On the other hand there are two lovely, large wet rooms each with a sink and w.c. for use with children or wheelchairs. There are washing lines for drying laundry. A site with a very relaxing ambience. An ok campsite, there is not too much to do in the area, we went to Portugal for the day! The staff were lovely but spoke limited English which isn't a problem for us but might be for some! Unfortunately my girlfriend said the women's showers did smell abit, however quite clean, also the showers had a bench in the middle of the room where you left your clothes with only a shower curtain inbetween, it felt like we were back at school which wasn't great. Quiet secluded camp site, in beautiful surroundings close to the National Park and local lakes. As a result limited shops, fuel etc. but beautiful just the same. We had a very warm, friendly and informative welcome from the owners who seem to do most of the work. Facilities are good for caravan and motor home, spotlessly clean and always hot water. Access onto the pitch requires small ramps or utilising the many pieces wood, due to the kerbs. We must say that the food was both excellent value and good quality. Good dog walks outside the site, flora and fauna to be seen and heard from the pitch day and night. Really good information is available from the owners on interesting places to visit in the locality. Wi fi was good most times. A lovely relaxing site and worth more than a brief stop over. This part of Spain was surprisingly beautiful. Very few seasonal Spanish pitches. The pool and sports facilities are not open until June onwards. If we ever revisit this area, we would certainly stay at this camp site again. A wonderful site with a fabulous restaurant. Very friendly owners greet you. Shower block was spotless with very hot water. Also good washing up facilities. The pitches are large and good free wifi on the pitch. Planned two nights but stayed three. The restaurant/bar is open all year and busy with locals. We had tapas one night, delicious garlic chicken. The beef stew and meatballs were both excellent. Really good home cooking and plentiful. Excellent value with an aperitif of Migdalia, two courses, dessert, bread and wine. Plenty to see in the area by bike or car and just a great place to relax with the sound of birds one. One of the nicest sites we have stayed on. We came for a day and stayed a week which says it all really. When peace, tranquility and relaxation is your goal this is a must. Restaurant with bar serves local quality home cooked food in the best campsite restaurant we have come across (treat yourself to one of the ordered specials). The quiet excellent roads are a joy to cycle bringing you to local villages in the National park. Do not pass this excellent campsite run by Yolanda, Enrique and staff who have the perfect mix of professionalism and hospitality which makes you feel really welcome. WI-F and 10 amp electricsI excellent. When we arrived we had a very friendly welcome from campsite staff. It was very quiet when we stayed with only a few other pitches occupied. Pitches were large, with grass- some with shade from trees, others in open.It is set in beautiful countryside with excellent walking and biking from site. Facilities are excellent and even with only a few people there the bar and restaurant were open all day from 10am. The swimming pool did not open until the end of June however. Wifi was good and could be found over most of site. This site is a secret Jewel in untouched surroundings, don't tell everybody! This site is super! Lovely people, so very helpful! If you want to see Iberian Wolves this is the place to come. Exceptional food cooked by the owners all fresh and cooked to order. Would you like to book Campsite Sierra de la Culebra or request more information? You can do both using the information below. A52 Benavente-Ourense exit 49 N631. After 4 km ZA912 dir. Alcañices 20 km after Mahide ZAP2438 dir. Figueruela, site after 3 km. Or E82 Zamora-Bragana at Alcañices N631. CampingCard ACSI will send your information request to "Campsite Sierra de la Culebra".